Thursday November 7th 1889 Mother finished the ironing this morning and I gave the upper story a good cleaning up. I went to town as soon as I ate my dinner. I got some new towels and was at Hatts awhile. I called on Aunty Walker on the way home. We had a letter from Father today. There is a Democrat governor elected to the state. Friday November 8th 1889 I was busy about the house work all the forenoon. I washed all the afternoon and evening making towels. It was a gloomy afternoon and evening with slight rain. Will did not go down town in the evening. Saturday November 9th 1889 I was busy all forenoon with cleaning up the house and doing baking. I did some work in the garrett soon after dinner and then Mother and I went to town. I got some groceries. We were at Hatties awhile. It was a very nice day and the men were busy with the corn. Sunday November 10th 1889 It was a lovely day and Will and I went down to Aunt Ems for a farewell visit with Anna as she goes to Kansas in a few days. We had a nice ride and visit. We got home early. I wrote in the evening. Monday November 11th 1889 Will sold four steers to Uncle Jim Stevens this morning. They weighed 4,280 and he got $3.00 a hundred. Mother went to town before dinner and I fixed early dinner for Will to go to a sale. I was busy about the house most of the day. Worked in the yard some. Tuesday November 12th 1889 I was busy about the work most of the forenoon. Mother went to town and Will to the Stevens sale. I got Tom to help me do the washing in the aftrernoon. 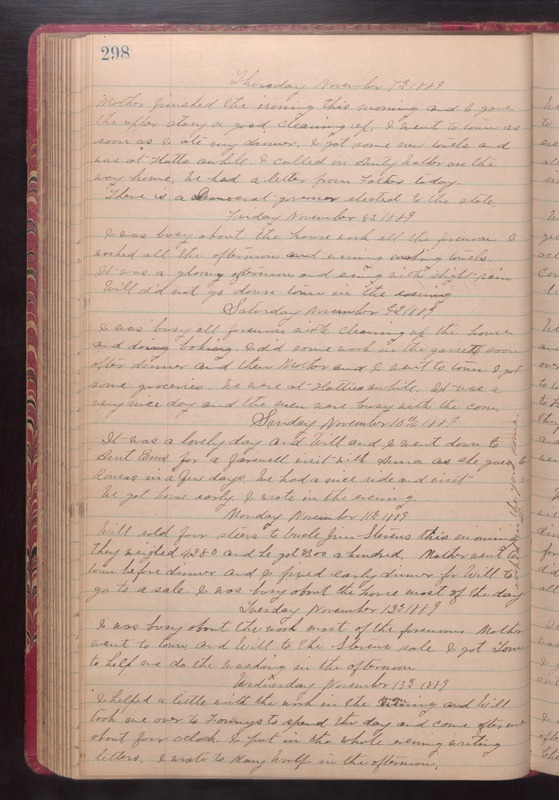 Wednesday November 13th 1889 I helped a little with the work in the morning and Will took me over to Fannys to spend the day and came after me about four oclock. I put in the whole evening writing letters. I wrote to Mary Woolf in the afternoon.